Candle massage is waiting for clients of our ThaiSun salons as a soothing and sensuous experience. Candle made of 100 % natural waxes guarantees blissful relaxation and proper moisturization of skin. After treatment skin'd be silky smooth and soft. Unique mixture creating base of candle is heated before massage. It includes plant oils such as soy oils, hemp seeds, rice, apricot seeds or grapes. Heating of candle change it into liquid state and in the air aromas of avocado or macadamia floats. Oil from melted candle is warm while massage and it greatly enters into deep relaxation state. Offer is dedicated to all of the clients of our salons in Warsaw, Wroclaw and Cracow. We'd especially recommend this massage for overworked people. If your work connects with a lot of stress and effort, this massage' d be definitely helpful. Candle massage can be successfully treated as a SPA treatment due to its beneficial for skin properties. Regular sessions provide effects such as reducing muscles pain, harmonization of metabolism. Even after one massage, you' d be able to see the difference by the reduction of muscle tension and better condition of skin. We have a few time variants of this soothing massage. Recommended length of massage is 90 minutes. It's optimal time to see the results even after a first session. However, if you have more free time, we'd like to invite you for 2-hour session. During it even the most stressed people would be able to forget about all of the daily problems. The shortest variant- 60 minutes is a compromise between relaxing effect of massage and possesing short amount of time. 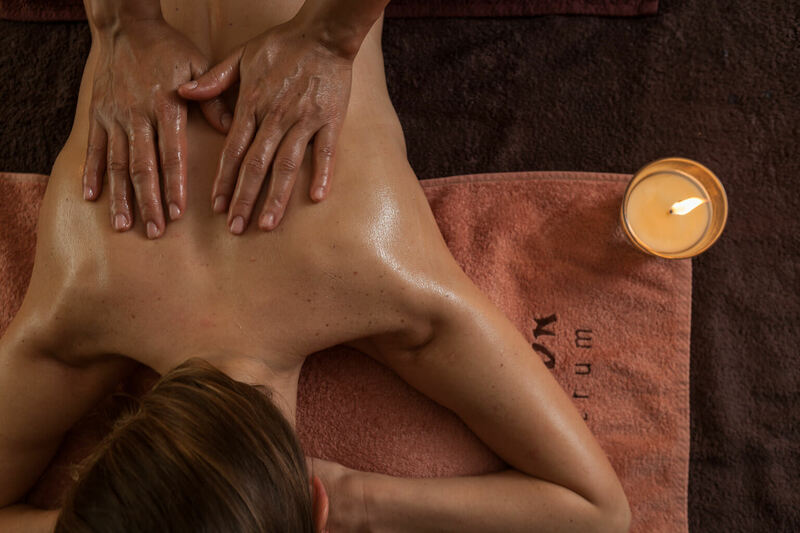 Candle massage perfectly connects with SPA treatments available in our salons. If you' re looking for an idea for a gift, combination of this massage and body peeling is perfect solution. Our priority is your relax and regeneration of tired organism- these effects you’d be able to feel straight after massage. Mixture of oil has unbelievably beneficial influence on your skin condition and whole body. Besides getting into deep relaxation state, this massage’ d reduce tension in muscles, so that your range of movements and overall mobility’ d increase. Your skin thanks to nutritional oils would be more moisturized and nourished. What is more, regular session can reduce cellulite and fasten metabolism. The most important facts is that the massage is "warm". Oil, which is made of gradually melting candle, is put into skin. Hot temperature of its helps to get deeply into the skin and to faster reduce tension of muscles, so that results are even better. Taking care of your comfort, before massage we'd give you disposable underwear, so you don't have to take with you any additional clothes. Treatment is performed in lying position, similarly to oil massage. When the tensions in your feet and legs are reduced, masseur wraps them with a towel. It helps beneficial oils to get into your skin. After back massage, you change position to lying on your stomach. Masseur concentrates on your chest, forearms and hands. Session ends up with delicate head and face massage. We'd not recommend to wash off oils straight after massage. Substances inside it would work and care for your skin for a few hours after treatment. This massage is very sensual experience. It’s done with hot oil from candle, made of 100% natural waxes and mixture of etheric oils. Thanks to that you can be sure that after massage your skin’d be moisturized,silky smooth and soft. Base of candle consist of natural, plant oils such as soy oils, hemp seeds, rice, apricot seeds or grapes and shea butter and vitamin E.
Whole body massage, ‘warm’, is performed in disposable underwear. Massage is done in lying position. The technique of treatment resembles classical oil massage- starts from feet and legs and ends up with head massage. Masseurs ue hot oils and waxes during session. The difference is a depth of action- hot oils get deeply and work stronger than a conventional ones. Mixture of waxes and etheric oils is heated up to pleasant temperature of 40 Celsius degrees. We higly recommend candle massage for people, who are dealing with fatigue syndrom. After treatment, you’ll feel energy boost. On the other hand, your skin thanks to unique mixture of waxes would gain new glow.